Improve forecast accuracy with accelerated forecasting and deeper analysis with Collaborative Sales Forecasting from Valizant. Manage the forecasting process across your entire organisation. Easily collect and update forecasts and new product plans to compare against regional and global targets. Track and manage the global forecasting process. Why Anaplan for Collaborative Sales Forecasting? Valizant Collaborative Sales Forecasting puts everyone in sales organisation on the same page - aligned with company assumptions and objectives. With real-time collaboration, the forecast reflects the current pulse of the customer and a step-change in forecast accuracy. Less time spent collecting data and navigating spreadsheets - more analysis time and improved accuracy. 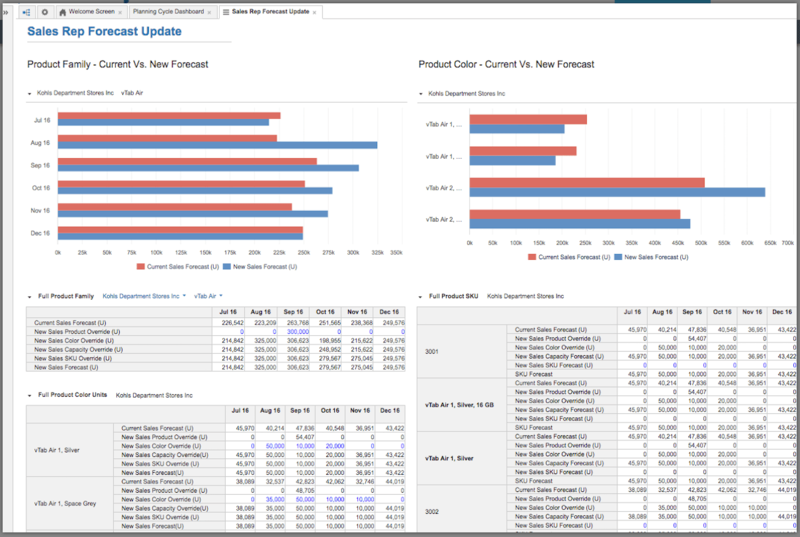 Composite dashboards enable multi-level forecasting in a single real-time view. In the moment changes to any level of the forecast: product line, product or SKU. Spot unexpected changes and take corrective action before plans are locked down. Real-time dashboards reflect changes from previous forecast and a comparison to targets. Drill-down identifies drivers and enables quick adjustments to resolve the deviations. Establish an effective, stable and repeatable forecasting process. Tracking dashboards provide management with a snapshot of the current forecasting cycle to ensure timely completion. Easily update assignments due to product and organisational changes. This app lets you clearly define data driven criteria to segregate customers into three categories – Focus group, Strategic group and Other. Each group of customers may require different plan of execution. Unpredictable changes in the marketplace require companies to frame strategies and align resources based on a deeper understanding of their customers. This means having their fingers on the pulse and a heightened awareness of customer behavior. However, as their customer base grows, most organizations lack tools and processes that can help them see these shifting trends. This app lets you clearly define data driven criteria to segregate customers into three categories – Focus group, Strategic group and Other. Each group of customers may require different plan of execution. As an example, customers in the “Focus” group may require prioritized services, while those falling under “Strategic” may need more investments matching risks, and the “Others” may be safely planned as a group with-out material impact to revenue plans. Why Anaplan for Customer Segmentation? Use organization’s business data to segment customers based on their revenue contributions and strategic fit. Frame appropriate execution strategies for different group of customers. Create a plan focused on fewer customer accounts that are most likely to drive business objectives. Increase awareness of changing customer behavior using business data collected and analyzed over multiple periods. Observe revenue contribution pattern for each customer segment over the years. Recognize shifts and trends in customers’ behavior and use this information to plan better. Question your current assumptions and customer segmentation strategy in the light of business outcomes. If your customer strategy is not getting you the desired results, revisit your strategy and re-plan execution. Overrule segmentation suggestions based on expert judgement if necessary. Simplify your customer segmentation review process using Valizant’s production grade, ready to plug-in and easy to use app. Create formal review cycles concluding in a final approval step. Archive each version of segmentation policy for future reference and retrospective analysis. Using business rules configured in this app, divide your customers into different groups. You may group customers based on actual revenue, sales forecast, recent market trends or any data point that is a strategic indicator. Review the app recommended strategy for grouping customers at global and regional levels. Compare the contribution of these focus and strategic groups of customers versus other customers. Review your current plan with app recommended customer segmentation. Make adjustments to current plan based on app recommendation, if necessary. You may also choose to overrule the app recommendation based on expert judgement or strategy. Compare your current customer segments with past segmentation that are available in archive. Observe how the population and composition of each segment changed over time. Validate your current assumptions based on the past evidences. Make changes to segmentation policy whenever necessary to make it more aligned with the business scenario. Regroup any set of customers based on judgement. Make customer segmentation review activity a formal and traceable cycle in your organization. Go through a review and approval process after which the segments are locked for the period. Archive older segmentation snapshots for retrospective analysis. This offers a way to validate older assumptions and evaluate durability of customer strategy. Holding the right levels of inventory, closest to the point of demand generation is the key to deliver highest levels of Demand Fulfillment and Customer Satisfaction. However, defining the right inventory levels and being able to consistently meet that target is difficult, especially in a Multi-Echelon Distribution Network where multiple product families are procured from multiple suppliers and are stored across multiple locations. One key aspect that separates highly successful distribution networks from others is their ability to predict demand and supply at forward locations, and respond effectively by making the right allocations and transfers across the distribution network. Valizant’s Demand Driven Distribution app on Anaplan helps you achieve this capability more easily through its comprehensive design and ready to use technology. Why Anaplan for Demand Driven Distribution? Replace inefficient top-down Inventory Allocation methods with a pull driven process that is more realistic, responsive and accurate. Respond to market demand by positioning right levels of inventory at right locations. Improve customer satisfaction by recognizing exceptions before lead time. View Supply Exceptions by Product Family, Location, and Suppliers in a single dashboard. Review exceptions that have highest business impact in the short term and in the long term, for example over 30 day, 60 day and 90 day periods. Uncover reasons of exceptions by going down to the details using drill down capability. View ERP level detailed information like Recommended Receipts versus Requests, Planned Transfers versus Requested Transfers, for Product SKUs, filtered by attributes like Color and by forwarding locations. Tie your Supply Plan decisions to actual execution. Respond to exceptions by raising ERP requests like Transfer Orders, Purchase Orders, or by expediting shipping modes, right from the Valizant app on Anaplan. Review impact instantly when ERP data is updated. Model your “N” level Multi-echelon distribution network. Define replenishment sources for the lowest level forwarding locations to mid-level warehouses up to the regional distribution centers. Design your multi-echelon distribution network taking into account the key decision attributes like Minimum Order Quantity, Order Multiples, Transit times and Lead time offsets. Create a pull based Distribution network where the demand forecast close to the points of consumption drives inventory allocations at storage locations across the network. Overcome the inefficiencies of a top down inventory “push” network. Get the low down on Unfulfilled Demand (Projected Inventory versus Demand Forecast) at finer levels of detail. Review inventory shortfalls for SKUs by Supplier and by Locations. Review Unallocated Transfers for products and locations, Planned Transfer Receipts, Requested Transfer receipts and Recommend Transfers. Adjust the supply network after reviewing the extremes, locations where supply is below minimum target inventory and above maximum inventory. Adjust lead times, change replenishing sources, Transit Times, by Warehouse. Adjust time fence and planning horizon in a simple user interface. Superior Forecast Quality improves customer satisfaction, reduces inventory costs and drives higher margins. Valizant’s Forecast Variability Analysis app on Anaplan helps your organization achieve better forecast quality. With this app, you can set clear and unambiguous forecast quality goals at your organization. You can align your teams to these goals in clear terms that they relate to. You also get a live picture of Forecast Quality on the go and understand how forecast varies by Teams, by Products, by Regions and by a combination of all these, at different levels of detail. Most importantly, this app helps you quickly interpret impact of Forecast quality on your business and act on time with precision. Why Anaplan for Forecast Variability Analysis ? Superior Forecast quality delivers greater value across the organization. Our application enables you to communicate and measure Forecast Variability in de-jargonized and easy to understand terms. Greater resonance in teams leads to quicker adoption of the Forecast Collaboration process. Starting your Planning cycle with Forecast data means better Planning and decision making. With our app, you can start measuring quality of forecast as soon as you plug it in. Data crunching exercises that delayed your planning cycles are history! To be able to isolate forecast variability to areas where they cause highest business impact is crucial. With our app you can “click through” aggregate data to fine-grained details and locate large exceptions. This is data you can act on! A tool that is effortless to set up and easy to use gains great adoption and delivers value quickly. Our pre-wired, production grade app gives you a “Live” picture of forecast variability at your organization. See the big picture. Determine financial impact of Forecast Variability on Revenue and Margins. Measure dollar impact of lost Sales at Customer Account or Geographical Regions. Build a culture of accountability. Hold teams accountable to their forecasts. Measure performance of teams and also individual sales reps across Product Lines and Geographies. Act promptly when it is most necessary. Review large exceptions, determine impact, make an informed decision and act on them. Click through from higher level aggregate views to fine grained details. Uncover hidden problems that might have passed along unseen under layers of aggregate information. Drill down from Product Lines to product attributes like Color and review forecast performance. You don’t have to choose between Relative and Absolute measures. Combine them in a single view and use both dimensions to form the right understanding and make the right choice. Also, look for BIAS and realign objectives. Set custom thresholds for Target Error and Max Error at different levels. Change threshold levels on the fly in your dashboards and refine your decision. Events happen and produce outliers. Identify the abberations and the events that caused them. Tag them to filter them out of future forecast signals. Establish decision accountability through audit trails. Add reason codes and rationale while making changes to your Plans or Dashboards. Compare multiple forecasts to understand if forecast collaboration cycles are adding value to forecast quality. This Demand Policy app by Valizant helps you to classify your product mix into three segments and assign an appropriate planning policy to each set of items. Creating demand forecasts for large product mix is an onerous task. Organizations, that plan demand for a large number of products across multiple customer locations, find it difficult to focus their efforts on a few product-customer combinations that truly require collaboration. In reality, not all products require Plan Collaboration. There are products that have steady coherence to statistical forecasts and their forecasts can simply be trusted. Then there are products that are slow moving or low margin where spending precious collaboration time is unnecessary. The challenge however is to identify these products quickly and put them into separate policy buckets. This is where a Demand Policy based Product Segmentation comes to rescue and helps you generate more impact for the efforts invested on collaboration. This Demand Policy app by Valizant helps you to classify your product mix into three segments and assign an appropriate planning policy to each set of items. Why Anaplan for Product Segmentation and Demand Policy? Take charge of your Demand Plan. Narrow down the list of collaboration planning items and direct everyone’s efforts on those few items. Generate more impact for the efforts invested on collaboration. Simplify the planning process by reducing unnecessary review meetings. New product introductions, market expansion goals and competitive strategy play a big role in Demand Planning apart from Revenue and Margins. Incorporate the parameters that are significant to your business in a comprehensive demand policy that is also highly executable. Set ground rules for classifying all your catalog items into collaborative planning, forecast driven planning and stocking policy based planning. Use Demand Volatility, Revenue, Cost, and Lifecycle stage as parameters to determine appropriate policy. Make the policy visible to Planners. Review your product mix quarterly or once in every 6 months, to factor in changing market conditions. This simple to configure and easy to use app will make it possible for you to refresh and realign even very large product catalogs. Create comprehensive Demand Policy rules based on product lifecycle attributes, sales revenue or forecast variability information and segment products into multiple planning buckets, example – Collaboration items, Forecast items and Stock items. Run demand policy rules on actual business data and narrow down the product mix that requires intensive plan collaboration. Focus your collaboration efforts on this segment. Segregate catalog items where forecasts are reliable or stocking policy is sufficient from the collaborative planning efforts. Review the products listed under each segment and review their population with respect to their revenue contribution. Adjust policy parameters if necessary and review how the segmentation changes. Iterate till you see a meaningful segmentation of products. Override the segmentation rules in the Demand Policy for any strategic reasons and review changes in segmentation. Undergo a formal review cycle of the finalized product mix by segments. Continue the process periodically to reflect changes in the marketplace.